Kokanee at Taylor Creek on Sept. 25. Not all the fall color at Lake Tahoe will be in the trees. 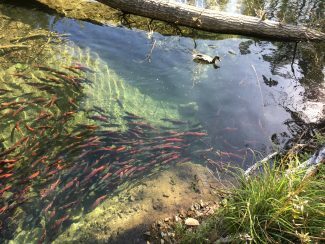 At least some will be in the water at Taylor Creek as the Kokanee salmon turn red to spawn. The Fall Fish Festival will take place at the Taylor Creek Visitor Center on Oct. 7 – 8. The Taylor Creek Visitor Center is located on Highway 89, three miles west of South Lake Tahoe. Hosted by the U.S. Forest Service Lake Tahoe Basin Management Unit in collaboration with the Tahoe Heritage Foundation, the festival is an opportunity to learn about the variety of fish species that live in Lake Tahoe and its streams including the federally threatened Lahontan cutthroat trout. The festival is from 10 a.m. until 4 p.m. each day. On Saturday, the U.S. Fish and Wildlife Service’s giant inflatable fish will serve as the gateway to activity stations for kids. Saturday and Sunday festival mascots Lulu the Lahontan Cutthroat Trout and Sandy and Rocky Salmon will make appearances and there will be special appearances by Smokey Bear. New this year is an iNaturalist booth and bioblitzes, which are open to anyone and family-friendly, will occur throughout the weekend. Bring smartphones with the iNaturalist app already downloaded and help catalog the natural wonders of Taylor Creek. Learn more about iNaturalist and download the app at https://www.inaturalist.org/. Festival events also include children’s activities, food vendors, educational booths, streamside information and Kokanee Trail Runs on Sunday sponsored by the Tahoe Mountain Milers. For information on the trail runs, visit http://www.tahoemtnmilers.org/kokanee-5k–10k–half-marathon.html. The Fall Fish Festival and Oktoberfest at Historic Camp Richardson Resort occur the same weekend, so the parking lot at the visitor center fills quickly. The Forest Service encourages attendees to bike, walk or take public transportation to the event. For more information on the festival, contact the Taylor Creek Visitor Center at 530-543-2674 or visit http://www.fs.usda.gov/goto/ltbmu/FallFishFest.